It’s not summer until we’ve been strawberry picking. Growing up, we went strawberry picking every Mother’s Day. The official start of summer in my mind; ditching the cooler days of Spring for shorts, sun and all-you-can-eat strawberry fields. For my first Mother’s Day this year, all I wanted to do was go strawberry with Van. Sadly, because of this crazy weather, the berries weren’t quite ready yet. So we took a rain check for a few weeks later. The idea was much better in my mind. Van lasted all of ten minutes until my mom had to take him back to the farm store while I finished collecting all the berries I could. It’s alright babe, we’ll try again next year. What to do with all of these berries? The possibilities are endless. I think I ate 5 cups of fresh sliced strawberries the moment we got home. Still warm from the sun, these are the berries I wait all year for. After eating them as-is, in ice cream and in my favorite spring salad, I ended up making tons of jam. 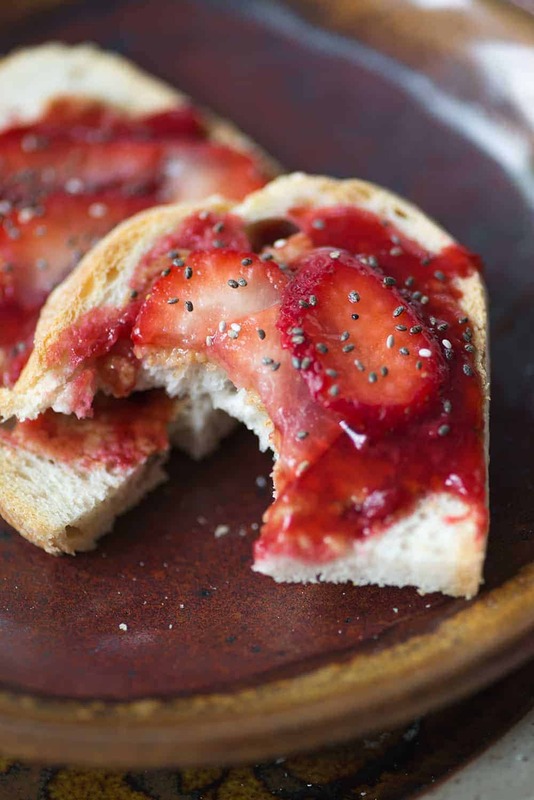 Strawberry jam feels like the gift that keeps on giving. We made two batches of this recipe, allowing me to stockpile jars of homemade jam for effortless gift-giving and thank you’s. Neighbors who took our trashcans in while we were gone? A jar of jam for you. A friend who picked up Van while I was running late from a meeting? Two jars of jam! Strawberry jam is really good currency. Since I’ve been cooking more for Vander, I’ve become more conscious on how much sugar and salt we’re consuming. 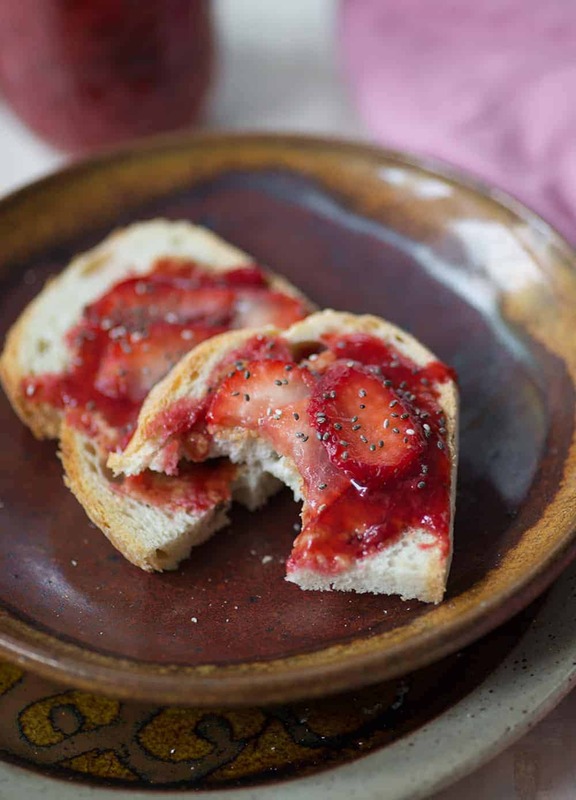 Therefore, it was a no-brainer that this jam would be lower in sugar than traditional recipes. Spoiler alert- you can’t tell. Sure, it’s not as cloying sweet as some jams can be- but who wants that anyway? 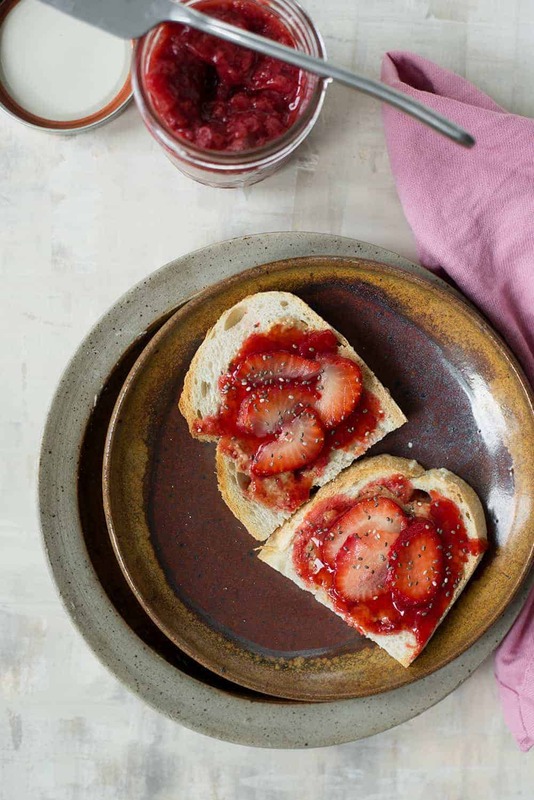 This jam tastes like summer! I swear I can still tastes the sun-kissed strawberries straight from the garden in every bite. Have you canned before? Years ago when we lived in our first apartment in Sacramento, I thought I was going to be one of those people who canned everything. We were living in the middle of salad bowl, with fresh grown produce of every variety on literally every corner. Why not learn to can? That lasted all of two months, but long enough for me to buy a few tools. A giant stock pan for holding a dozen mason jars, a funnel for easy filling and a magnet for placing the lid on top. Though, you really don’t need any of this. A funnel will make things easier, but you can do without. You will need a large enough pan to place the jars in, mason jars and that’s it! You can find low-sugar pectin in most grocery stores, or online. The regular pectin won’t work, so make sure you find the low-sugar one. 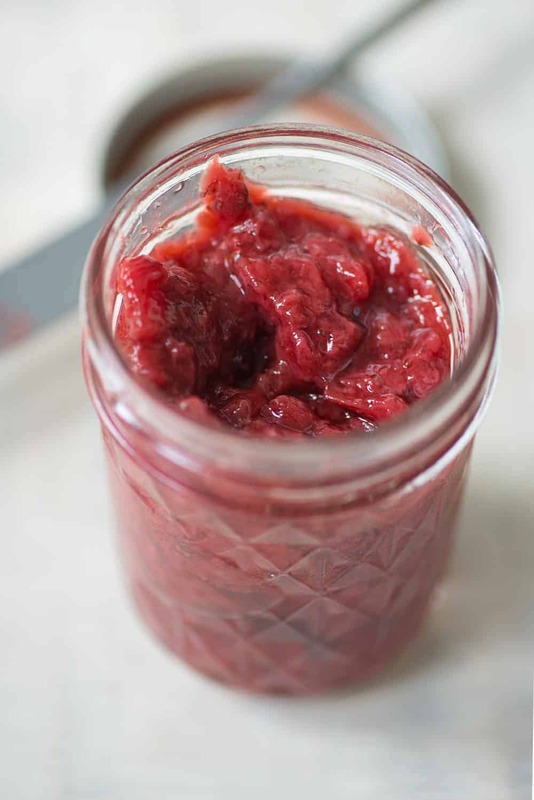 Homemade low sugar strawberry jam! Have fresh strawberries? 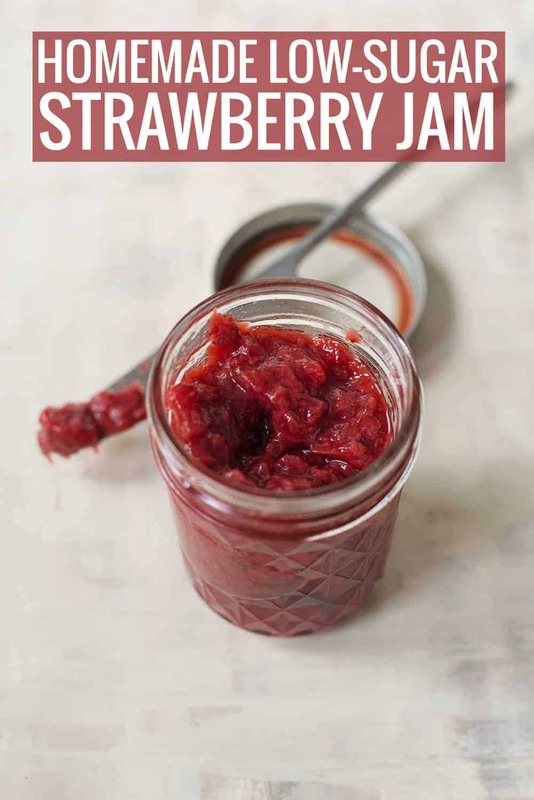 Make this jam! SO delicious and much lower in sugar than traditional recipes. Super easy, even if you’ve never canned before. No special equipment needed! If you are canning your jam, then I sanitize and prepare the jars. Boil them in a water bath for ten minutes, then remove. Not only does this help sanitize the jars, it also warms the jars before you put the hot jam in. 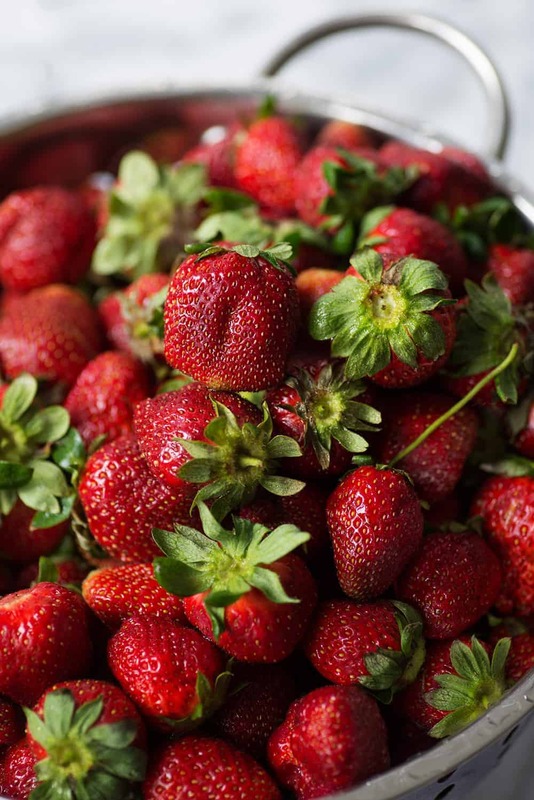 Wash strawberries and remove the stems and hulls. Crush the strawberries either by using a food mill or hand potato-masher. 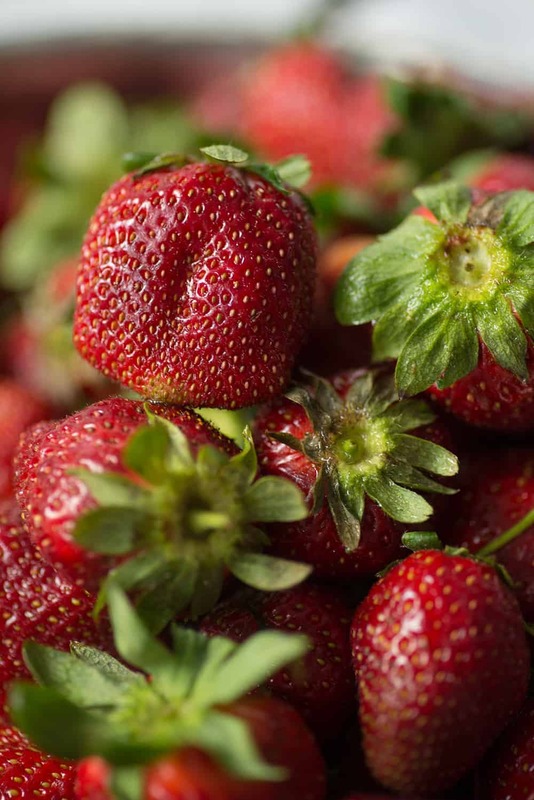 If you want jelly, then blend the strawberries in a blender and strain the juice, discarding any seeds and pulp. 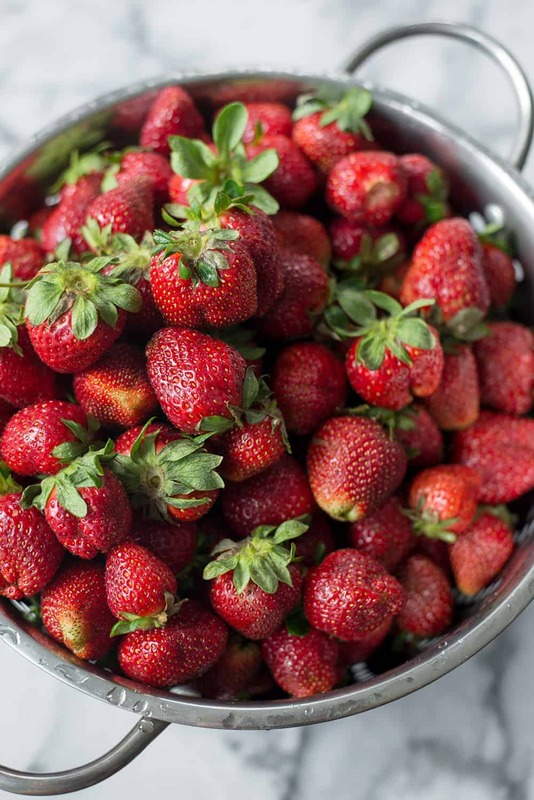 Place strawberries, water, and lemon juice in a large stock pot. Stir in pectin and heat the mixture over high meat until it comes to a rolling boil that cannot be stirred down. Keep stirring the mixture to prevent the bottom from burning. Add in the sugar and return to a rolling boil. Continue boiling for a minute, while stirring then remove from heat. If you don’t plan on canning the jam then let cool for a few minutes before pouring into containers. Cool completely, then place in the fridge to harden. You can store jam that hasn’t been canned for ~5-6 days. If you are canning the jam, place a funnel in jar, then ladle the hot jam into the warm jars, leaving a 1/4″ head space. If any jam got onto the lid space, clean off then top with lids and rings. Place sealed jars into a boiling water bath and boil, fully submerged, for 10 minutes. Carefully remove jars (I use tongs or my special canning tongs) and place on a cooling rack to cool. Once cooled, the lids should seal. You can check this by pressing down on the center of the lid- if it is able to be pushed down, then it hasn’t sealed correctly. The one’s that haven’t sealed (if you have any) can either be reprocessed in a water bath or just placed in the fridge to eat immediately. Can the same method and ingredients be applied to blackberries as well? Hi Emily, I don’t see why not? I think any berry fruit would work the same way.